The Jazzy 614 HD is a mid-wheel drive wheelchair classified as Heavy Duty based on the HD in the name. This is, in my opinion, the best chair available on the market based on quality and usability. The charge time is decent at 11 hours and the chair will support 450 lbs which is more than adequate for your every day user. This is also a hefty jump from the standard Jazzy 614 which only has a weight spec of 300 lbs. From thin to heavy, this motorized wheelchair comes with a seat that is 24″ x 24″ which makes for very comfortable seating. The Available in Blue or Red without any upcharge. 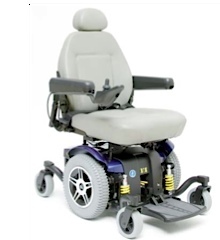 This chair can easily be changed to free wheel in case your batteries are running low or you just want to move around without the motor assist. The seat also folds all the way back which is a great option. The chair is very easy to take apart so this is also a plus. An excellent choice. Durable and easy to use. This would be the last motorized wheelchair you would ever have to buy. Price is moderate starting at $2000 for a used one and a decently optioned new for just under $4000. Hope this review helps, I’ve opened up commenting on this page so if you have questions on the chair post them below!